Jesus about to be struck in front of the High Priest Annas, as in John 18:22, depicted by Madrazo, 1803. In the New Testament, the Sanhedrin trial of Jesus refers to the trial of Jesus before the Sanhedrin (a Jewish judicial body) following his arrest in Jerusalem and prior to his dispensation by Pontius Pilate. It is an event reported by all four Canonical gospels of the New Testament, although John's Gospel does not explicitly mention a Sanhedrin trial in this context. Jesus is generally quiet, does not mount a defense, and rarely responds to the accusations, but is condemned by the Jewish authorities when he will not deny that he is the Son of God. The Jewish leaders then take Jesus to Pontius Pilate, the governor of Roman Judaea, and ask that he be tried for claiming to be the King of the Jews. The trial as depicted in the Gospel accounts is temporally placed informally on Thursday night and then again formally on Friday morning (see the article on Crucifixion of Jesus for a discussion on the exact date of Good Friday, which in recent years has been estimated as 33 AD by different groups of scientists). In the narrative of the canonical gospels, after the betrayal and arrest of Jesus, he is taken to the Sanhedrin. From a historical perspective, in the era in which the narrative is set, the Sanhedrin body was an ad hoc gathering, rather than a fixed court. In the four canonical gospels, Jesus was tried and condemned by a majority of the Sanhedrin members, although at least one member, Joseph of Arimathea, dissented from this decision. He was mocked and beaten and condemned for making the claim of being the Son of God. Although the Gospel accounts vary with respect to some of the details, they agree on the general character and overall structure of the trials of Jesus. Matthew 26:57 states that Jesus was taken to the house of Caiaphas the High Priest, where the scribes and the elders were gathered together. Matthew 27:1 adds that, the next morning, the priests held another meeting. Mark 14:53 states that Jesus was taken that night "to the high priest" (without naming the priest), where all the chief priests and the elders gathered, and Mark 15:1 adds that another consultation was held among the priests the next morning. Luke 22:54 states that Jesus was taken to "the high priest's house" (without naming the priest), where he was mocked and beaten that night. It is added in 22:66 that, "as soon as it was day", the chief priests and scribes gathered together and led Jesus away into their council. In John 18:12-14, however, Jesus is first taken to Annas, the father-in-law of Caiaphas, who was the high priest at that time. Annas is believed to have been the former high priest, and it appears that Caiaphas sought Annas' confirmation of Caiaphas' actions. In 18:24, Jesus is sent from Annas to Caiaphas the high priest, and 18:28 states that, in the morning, Jesus was led from Caiaphas to Pontius Pilate in the Praetorium. In all four Gospel accounts, the trial of Jesus before the priests and scribes is interleaved with the Denial of Peter narrative, where Apostle Peter who has followed Jesus denies knowing him three times. Luke 22:61 states that as Jesus was bound and standing at the priest's house Peter was in the courtyard. Jesus "turned and looked straight at him", and Peter remembered the words Jesus had spoken to him: "Before the rooster crows today, you will disown me three times." In the Gospel accounts, Jesus speaks very little, and gives very infrequent and indirect answers to the questions of the priests, prompting an officer to slap him. In Matthew 26:62, the lack of response from Jesus prompts the high priest to ask him: "Answerest thou nothing?" In the Gospel accounts, the men that hold Jesus at the high priest's house mock, blindfold, insult and beat him, at times slapping him and asking him to guess who had hit him that time. 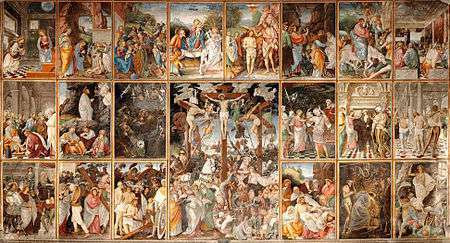 Mark 14:55–59 states that the chief priests had sought witness against Jesus to put him to death but did not find any, so they arranged false witness against him, but their witnesses did not agree together. Mark 14:61 states that the high priest then asked Jesus: "Art thou the Christ, the Son of the Blessed? And Jesus said "I am", at which point the high priest tore his own robe in anger and accused Jesus of blasphemy. In Matthew 26:63, the high priest asks: "tell us whether you are the Christ, the Son of God." Jesus responds "You have said it", prompting the High Priest to tear his own robe, breaking Mosaic Law (Leviticus 21:10). In Luke 22:67, Jesus is asked: "If thou art the Christ, tell us. But he said unto them, If I tell you, ye will not believe". But, in 22:70, when asked "Are you then the Son of God? ", Jesus answers "You say that I am", affirming the title Son of God. At that point, the priests say "What further need have we of witness? for we ourselves have heard from his own mouth", and they decide to condemn Jesus. 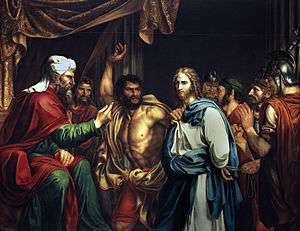 Thereafter, in Pilate's Court, the Jewish elders ask Pontius Pilate to judge and condemn Jesus—accusing him of claiming to be the King of the Jews. 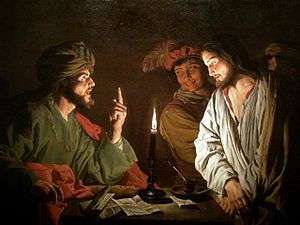 Matthias Stom's depiction of Jesus before Caiaphas, c. 1630. 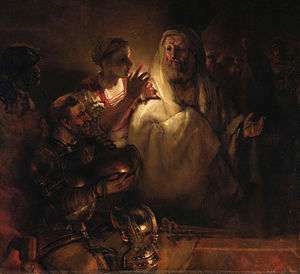 Rembrandt's 1660 depiction of Peter's Denial. Jesus, in the upper right hand corner, is at the high priest's house, his hands bound behind him, and turns to look at Peter. ↑ Isaac Newton, 1733, "Of the Times of the Birth and Passion of Christ", in Observations upon the Prophecies of Daniel and the Apocalypse of St. John (London: J. Darby and T. Browne). ↑ Bradley Schaefer, 1990, Lunar Visibility and the Crucifixion Quarterly. Journal of the Royal Astronomical Society 31. ↑ John Pratt Newton's Date For The Crucifixion "Quarterly Journal of Royal Astronomical Society", Sept. 1991. ↑ Brown, Raymond E. An Introduction to the New Testament Doubleday 1997 ISBN 0-385-24767-2, p. 146. Brown, Raymond E., et al. The New Jerome Biblical Commentary. Prentice Hall, 1990, ISBN 0-13-614934-0.